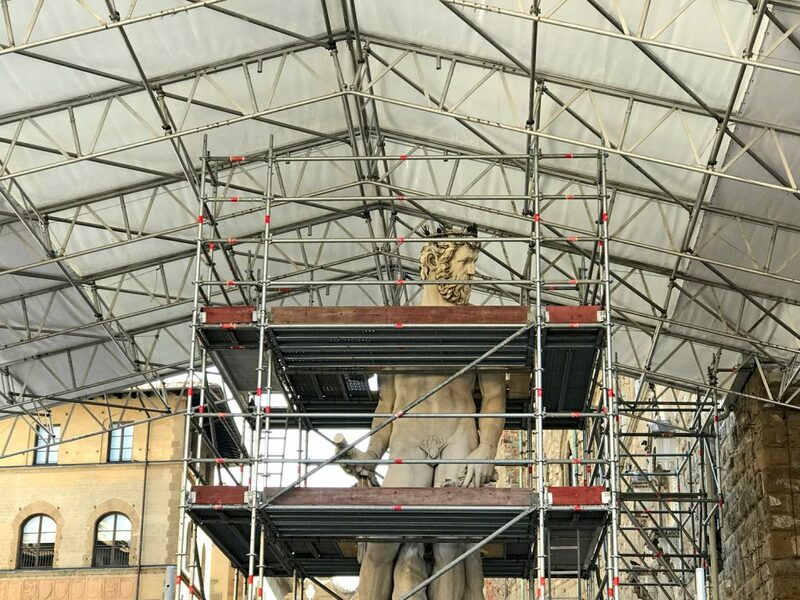 Last February, the restoration on the Fontana del Nettuno or Neptune’s Fountain located in Piazza della Signoria finally began. The large fountain, noted both for its majestic architecture and for its position, is an interesting site to behold for tourists. We can only imagine, the disappointment one feels when they see the metallic cage that keeps it hidden from sight in this period. The fountain was built by Bartolomeo Ammannati by request of Cosimo I de’ Medici and alludes to the dominating marine power of Florence in the period of the Renaissance. It has been (affectionately) nicknamed “il Biancone” (the big white thing), which makes fun the brightness of the statue (almost excessive). The glow of the stone which is an enormous block of prized Carrara marble. If you don’t appreciate the Florentine people’s dry humor, you would (almost) think that the locals don’t hold the fountain in high esteem. The bad news is that the restoration will be long and the work will last (at least) another year. However, there is some good news for those of you who have planned to visit the city over the course of the next few months! You can still to see the fountain — at least parts of it. The cage that protects the sculptures during the work also includes a walkway and transparent walls, which will allow you to see everything from a rather interesting perspective and definitely very “up close”. The official calendar for the visits has not yet been open to the public, but you will be able to take advantage of “guided tours” on weekdays. The visits are free and will begin on the 3rd of May (for now the visits are open only til the 31st of May). Every visit will be conducted by a person from the rrestoration team lasting approximately 15 minutes and consist of 15 persons. You need to reserve your spot, which is easy! Just go to the official website (scroll down their page to find the calendar) and select the day and hour you prefer, and you will receive a confirmation email.